The government expects a considerable drop in internet charges early next year on the back of several multi-million kina communications projects currently underway. 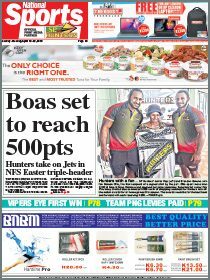 Meanwhile, internet users are crying foul over a large increase (about 300 per cent) of already expensive internet rates by state-owned company Kumul Telikom Holdings last week. MARK HAIHUIE reports on the government’s future plans in light of the high costs faced by internet users. People in Papua New Guinea should expect to have the same internet speed and, more importantly, pricing that people in Australia get, say Minister for State Owned Enterprise William Duma and DataCo managing director Paul Komboi when they visited telecommunications projects in Port Moresby last week. The Coral Sea Submarine Cable is the first of these projects, mainly financed by the Australian government with recipients Papua New Guinea and the Solomon Islands chipping in as well. The Australian government has not disclosed the total cost of the project but Papua New Guinea is expected to contribute 10 per cent of whatever it is, Duma said. The cable will run from Sydney to a point in the Coral Sea where it will be split between Port Moresby and Honiara, in the Solomon Islands. It will be laid by Australian company Vocus and ready for use by the end of next year. It will be the third submarine cable to the country, with the other two being the PPC1 Cable which connects Madang to an Australia- Guam link, and the older APNG2 cable running from Australia to Port Moresby. Duma said the Coral Sea cable will be carrying speeds of 10 terabits per second (Tbps) and that should be enough for PNG’s needs for the foreseeable future. “This cable would then mean our people can enjoy quality and reliable services at affordable rates as the usage on this asset grows and the unit costs of delivery drops,” he said. “The current submarine cable landing in Port Moresby (APNG2) has a total usable capacity of about 800Mbps (megabits per second) currently but this new cable will have about 100,000Mbps on completion on a full-design capacity of about 10 million Mbps. “The project will be coordinated and monitored by the Department of Treasury and Department of National Planning and Monitoring as it is part-funded under development assistance by the Australian government. “The National Executive Council has decided that PNG DataCo Limited, which is the State Owned Enterprise responsible for the provision of wholesale ICT transmission services under the newly restructured business of Kumul Telikom Holdings Ltd (KTHL), will be the implementation agency during the project construction and will own, manage and operate the cable system after the project commissioning. However, the Coral Sea cable only partly solves the jigsaw puzzle that is the country’s communications woes as it only comes into Port Moresby. Considering the obvious fact that the nation’s capital is not the nation, the government has also commissioned a Kumul Domestic Cable project to spread improved internet from the Coral Sea cable nationwide through a network of existing fibre optic cables and other links still under construction. communications medium, fibre optic submarine cable,” Duma said. The project is currently underway where preparations for the sites is now advancing for the Port Moresby-to-Madang segment via Alotau, Popendetta and Lae. It is financed by a loan of more than US$200 million (K650mil) from the Exim Bank of China. The main contractor is Huawei PNG, which is doing site readiness and marine surveys to complete the project by February. DataCo managing director Paul Komboi urged internet providers to start buying wholesale internet from DataCo in preparation for the completion of the cable network. He expects the internet rates to drop by 20 per cent at least. Komboi said wholesale pricing will be based on recovering the cost for both domestic and international infrastructure. The third and final large-scale communications project is the US$10 million (K33mil) O3b satellite tower and refurbishment of the Kumul Telikom Holdings earth station at Gerehu, Port Moresby, to cater for the Asia-Pacific Economic Cooperation meetings in November. It is also being funded by Australia. 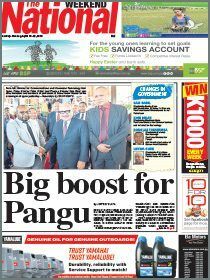 “PNG DataCo is now working with an international satellite operator, SES Networks, to deliver 6.0Gbps of high-speed, lower-latency (150ms) internet service between Port Moresby and Sydney to support the 2018 APEC ICT requirements,” Duma said. “The 03b Satellite High Capacity Network is the highest satellite service capacity in the country and shall support advanced sea cable infrastructures following the Apec meeting. The government, through the support of foreign donors and lenders, aims to bring down internet costs, and the infrastructures involved in these projects will be the resources which will lead towards attaining that goal. However, that goal can only be achieved if the recently merged State companies under Kumul Telikom Holdings are able to efficiently coordinate the use of those resources so they can have a positive impact on the lives of people by making internet cheaper in Papua New Guinea.